Getting the right message to the right person, at the right time. Most sales and marketing teams work hard on creating the right message and finding the right person - but pay much less attention to finding the right time to get in touch. Yet pinpointing the exact moment when a company has need of your products or services can make all the difference in the world to your success rate. Sales people in general don’t always have the best reputation. That’s because we’ve all had the experience of being cold-called by reps trying to set appointments for products we don’t need. And we know how annoying it is to have evening meals interrupted by door-knockers - selling everything from bake-sale cookies and life insurance, to solar panels and the promise of eternal life. Those are all things that we may have an interest in some day...but probably not right now while your dinner is going cold. The timing is all wrong. Yet what if a plumber stopped by giving out flyers, and you had just discovered a burst pipe in the kitchen? Would you angrily point out the ‘No Hawkers’ sign on your front door...or would you welcome him and his toolkit into your home with open arms? No doubt your dinner would be forgotten, and you would hasten the plumber into the kitchen to get the job done. And you probably wouldn’t haggle over the price, because you need that burst pipe fixed right now. The plumber delivered the right message to the right person - at exactly the right time. If you were opening a burger stand, and you could have one advantage over your competitors, what advantage would you choose? So the right time to sell is when the buyer is hungry for what you have to offer. But how do you find the right time in B2B marketing? Every business is different, of course, and you will need to identify what works for your circumstances. But in general, there are several approaches we can use to contact people when they need help the most. Paid search ads are great for reaching people who are ready to buy, but competition is likely to be fierce. You need a very good sales funnel to make them profitable. Search engine optimization and content marketing can produce active buyers, but they are long-term strategies. 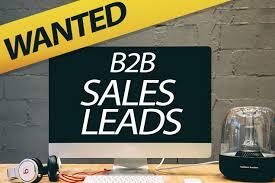 So for B2B lead sources, what else can you do to find hungry buyers who are ready to snap up your best deal? Let’s say you are marketing a SaaS product that helps with sales automation. A great target for this product is a company that is currently hiring sales staff. Set up job alerts on LinkedIn so you know who is hiring. This is a great way of tapping into companies who need all the help they can get with sales. If they have the need to hire sales staff and the budget to pay them, they are a great target for you. Another way to mine the web for valuable information is to keep an eye out for activity in your target industry. Look to see who is winning contracts, or starting major new projects. These may provide you an opportunity to get in with a proposal at exactly the right time. Set up Google alerts for relevant terms, so that you know instantly when relevant news happens in your industry. But don’t rely on those alone - keep a close eye on industry news sources, both online and offline. 2. To find out who is taking over their old job. Both executives will be looking to make changes and have an impact in their new role...and maybe you can help. In other words, we have a market of hungry buyers for whom the right time is right now. Research shows that the first sales person to contact a newly-funded company about their particular product service is likely to get the sale. This is a fantastic opportunity. All you need is a means of identifying these ‘wallet-out’ prospects reliably and efficiently. That’s where Fundz Pro comes in. How much would you expect to pay for a service like this...perhaps $100 a month? Maybe more? In fact, you can subscribe to Fundz Pro for just $10 a month, with no long-term commitment. That means you can start or grow any business even with a very modest marketing budget. Great - so now you have some excellent ways to source prospects who are ready to buy. But you are still only half way to making the sale. The next step is making contact with the prospect, and this is where most sales people trip up badly. Don’t make the mistake of using the company’s generic email address or contact form. Find the right person to contact using LinkedIn, and track down their personal email address. Better lead-generation services such as Fundz Pro will help you find the right contact details. But if you don’t have an individual email address from the get-go, dig deeper. There are many services available to help you locate email addresses. Snov.io is great because it offers a complete service from finding and validating the email to following up with a ‘drip’ sequence. Most cold email campaigns fail badly because they are all about the seller, and not about the prospect. The prospect doesn’t care about you, your company or your product. They only care about what’s in it for them. Cold emails that request an appointment or discuss ‘finding out if we’re a good fit’ are doomed to failure. Executives get these by the bucket load. With busy schedules and full in-boxes, they are looking for any excuse to hit the delete button. A good sales relationship is not about selling - it’s about helping. Get your relationship off to a good start by doing a small favor for the prospect. When you put all of the above together, you will create a lead-generation machine that creates sales more efficiently and effectively than ever before. You will be talking to the right people at the right time - delivering the right message to a non-stop stream of hungry buyers. This is a classic case of working smarter, not harder. So start filling your pipeline with ready-to-by prospects and multiply your success in sales. This article is a guest post by Rob Palmer of GoFreelance.